Water is one of the most important parts of a horse’s diet, and watering horses in winter can be especially challenging. How do horse owners keep fresh thawed water available to horses when temperatures drop below freezing? 1. What is the freezing temperature of water in °C and °F? 2. If the temperature is 10°F outside, are you concerned about your horse’s water freezing? 3. If the temperature is 10°C outside, are you concerned about your horse’s water freezing? On cool days, when a horse is just hanging out in the pasture or paddock, they may drink 40 to 48 litres (10 to 12 gallons) of water a day. 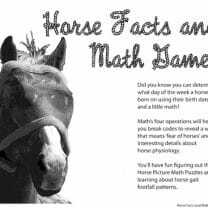 When the weather is hot, or the horse is working and active, that same horse might need to drink 80 or more litres (20 or more gallons) a day. That’s a lot of water! 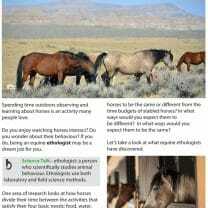 Imagine you have a job taking care of a neighbours three horses. 4. During the hot summer months how much water will you need to provide to meet the minimum needs of all three horses? 5. 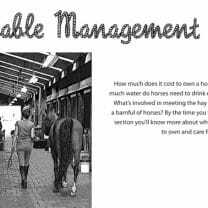 Once fall arrives and the days cool down, what is the minimum amount of water you will need to provide to meet the needs of all three horses? a) Horses’ need for water triples in hot weather. b) Horses’ need for water doubles in hot weather. c) In cool weather, horses’ need half the amount of water they need in hot weather. It is interesting to know that horses seem to prefer lukewarm (20°C or 68°F) water, especially during cold weather. Researchers have shown that ponies drank 38-41% less water when it was near frozen compared to when the water temperature was 66°F. So, watering horses in winter is a challenge. 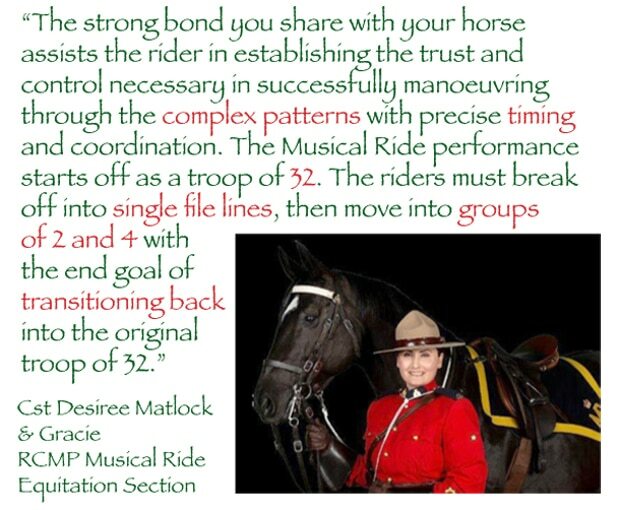 How do horse owners manage this? A poll asked horse owners how they keep thawed water available to horses when the temperatures drop. 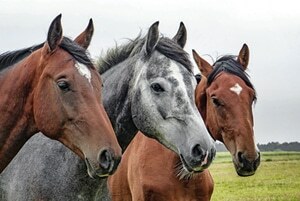 A total of eight hundred thirty-eight horse owners responded. 7. What was the most common method used to prevent the water from freezing? 8. 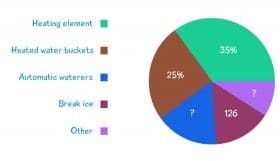 One quarter of respondents use which method to keep their horse’s water thawed? One horse owner lives in an area where it’s normal in January for the temperature to be 20°F to -10°F. She finds that high-watt floating tank heaters are a must. Science Talk – watt: the standard unit of power in the International System of Units (SI). 9. Eight more respondents use automatic waterers than do those who break ice. 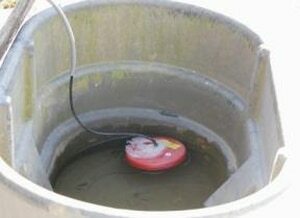 How many respondents use automatic waterers? 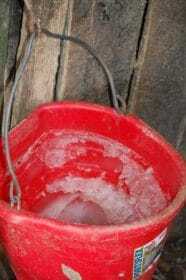 Many others said they add warm water to their horses’ buckets and troughs. One person said they carry buckets of warm water from the sink in the tack room to the horses five times a day! Another owner said they built insulated bucket holders that have been working well for almost 30 years. 10. What percentage of respondents use ‘Other’ methods to deal with the issue of watering horses in winter? Do you live in an area with cold winters? 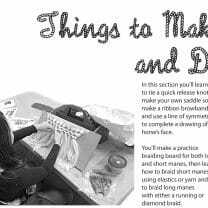 What methods are used by horse owners where you live? Answer: Water freezes at 0°C (32°F). Answer: Yes! This is 22° below freezing. Answer: No. This is 10° above freezing. US Customary Answer: 20 gallons × 3 = 60 gallons. You will need to provide a minimum of 60 gallons of water. Metric Answer: 80 litres × 3 = 240 litres. You will need to provide a minimum of 240 litres of water. US Customary Answer: 10 gallons × 3 = 30 gallons. You will need to provide a minimum of 30 gallons of water. Metric Answer: 40 litres × 3 = 120 litres. You will need to provide a minimum of 120 litres of water. Answer: Both ‘b’ and ‘c’ are true. Answer: Most respondents used a heating element (35%). Answer: 126 (number of respondents who break ice) + 8 = 134. One hundred thirty-four respondents use automatic waterers. Step 1: We still don’t know the percentage of horse owners who break ice and use automatic waterers. 134 (number of respondents who use automatic waterers)/838 × 100% = 0.1599 × 100% = 15.99%. Sixteen percent of respondents use automatic waterers. 100% − (35% + 25% + 16% + 15%) = 100% − 91% = 9%. Nine percent of horse owners use ‘Other’ methods to deal with the issue of watering horses in winter.